A touch of whimsy has come to Rocket Bingo with Pixie Wings. This beautiful game from Pragmatic Play has some amazing details and brilliant features which are sure to leave you ready for more. The first thing you will undoubtedly notice about this game is simply how beautiful it is. Pragmatic Play has lavished attention upon this game at every turn. The background consists of a peaceful fairy glade; with little animations of insects and fairies occasionally flying past. When it comes to the symbols themselves, they do not disappoint. The lowest paying symbols are creative takes on familiar faces any long time slot fan will know; a 10, J, Q, K, and A. The higher paying symbols represent the Pixies of the game’s title; a King in amber, a Queen in pink, a Prince in blue, and a Princess in green. There is also a Wild with the game’s logo and a scatter shaped like a mystical tree. Everything you need to play Pixie Wings is in the ribbon at the foot of the reels. Your bet is adjusted by clicking the plus or minus buttons on either side of the spinner. This will bring up a pop-up which will allow you to further adjust your bet until it is at a value you are most comfortable with. Then, all you need to do is hit the spin and see if you can land a winning combination! Wins are awarded for matching symbols landing on any of the paylines running from left to right across the reels. You need 3 matching symbols for the lower valued symbols but you only need 2 for any of the Pixies. To see more about the payout values or the paylines, click the ‘i’ symbol on the left of the screen to bring up the game rules. 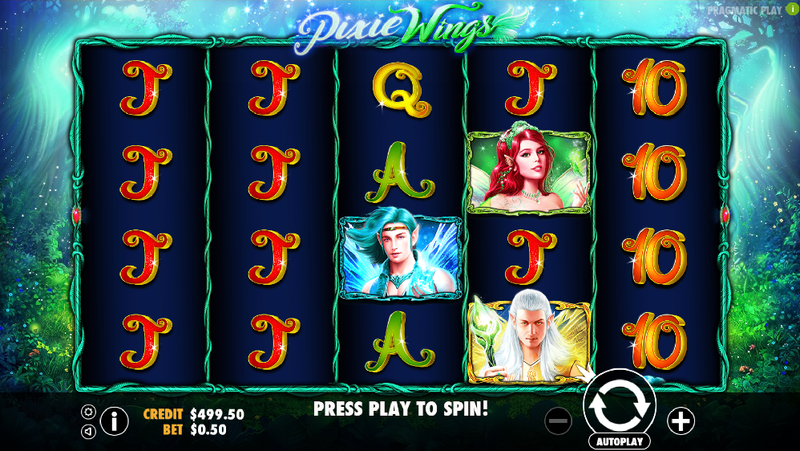 One of the main features of Pixie Wings is its amazing free spins. When you land 3 of the Tree scatters, you will be offered 5 different choices. You can choose any of the Pixies, each with their own number of free spins, or you can select the mystery option which will pick one Pixie or the Wild and will award you anywhere between 3 and 12 free spins. Pixie Wing’s other amazing feature is its super-stacked reels. The Pixie which you selected for the bonus spins will be super-stacked during the free spins game and in the base game, every new spin will see a different symbol chosen to be super-stacked. This amazing feature can grab you some fantastic wins! Pragmatic Play has given their players every opportunity here to win big in a beautiful setting. We love playing their games and this was no different. It is clear that they spent a lot of time on the artwork which serves as a clear indicator of the high-quality games they produce. The bonus features are great fun too. We would happily recommend this game to both new players and long-time slot lovers alike. It is perfect for a little escape from everyday life. If you are a fan of the fairy folk, you need to give this slot a few spins!